Out of the 5,193 historic statues decorating street corners in the United States, only about 7.5 percent depict women, and excluding fictional characters, New York’s Central Park has zero ladies in bronze, or in any other physical material for that matter. But, one company is working to change that — in a virtual world anyway. 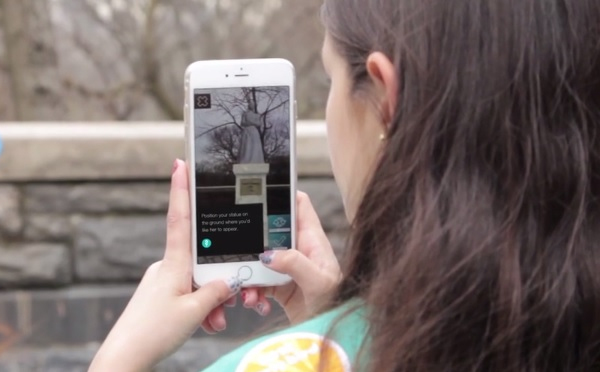 On Monday, May 1, communications firm Y&R New York announced The Whole Story Project, an augmented reality app aiming to bridge the gender gap with virtual statues in select cities. Think Pokémon Go, but instead of catching Pikachu, you’re viewing Amelia Earhart and Elizabeth Cady Stanton statues guided by a map. The app allows users to find statues of real women using the smartphone’s camera, augmented reality, and GPS in Central Park, Dante Park in New York City, Washington D.C. and Mount Rushmore, as well as outside the U.S. in London, Prague, Milan, and Rome. Mixing the real scene with computer-generated statues using the smartphone’s camera view, the app allows users to visualize a more diverse set of historical figures in public art, including sharing the images on Facebook, Twitter, and Instagram. Y&R started developing the app in support of the United Nation’s Sustainable Development Goal a year ago. The first virtual statue was placed last month in Dante Park before the Women of the World Summit, while Y&R and Girl Scout Troop 3484 added several in Central Park, including Amelia Earhart, Nina Simone, Edith Wharton, Shirley Chisholm, and Elizabeth Cady Stanton. The Whole Story Project is also aiming to make those virtual statues a physical reality by supporting efforts from organizations such as the Monumental Women campaign to place statues of Elizabeth Cady Stanton and Susan B. Anthony in New York City. The group is also working with the National Collaborative for Women’s History Sites to add statues of key players in the suffragist movement, set to be part of the 100th-anniversary celebration of the 19th amendment in 2020. The Whole Story Project is inviting developers to add their own virtual statues using their own software, with hackathons scheduled to support that goal. According to a Washington Post article in 2011, the latest data widely available, just 394 historic U.S. monuments depict real women — excluding fictional characters such as the Statue of Liberty.